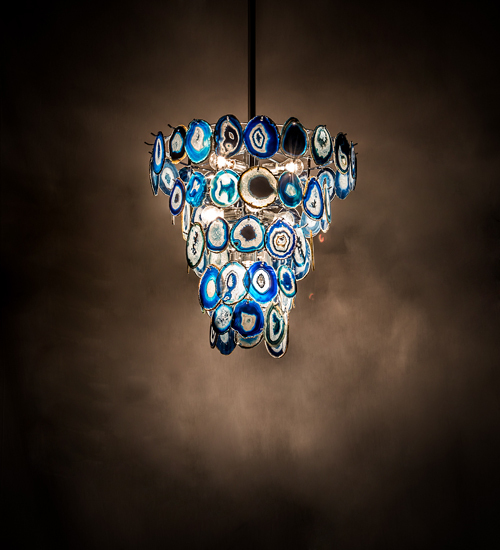 Description: A stunning array of Customer supplied Agate elements adorn this unique eclectic chandelier. This enchanting fixture is enhanced with a 5-tiered frame and hardware featured in a Chrome Plated finish. Although this specific chandelier is Not Available, similar designs are offered, as well as custom sizes, styles, and finishes. This personalized item demonstrates the level of expert craftsmanship performed in our 180,000 square foot manufacturing facility in Yorkville, New York.